As the 2018 golf season is beginning, Upstate New York’s premier golf destination is recognized with another impressive award from one of the leading national golf publications. The awards keep rolling in for Turning Stone - the time for its extensive golf offerings. The resort’s golf courses are teeing up the 2018 golf season by adding another impressive award to its list of accolades. With three championship-level 18-hole courses and expansive indoor golf facilities, Turning Stone earned Golf Digest’s coveted 2018 Editors’ Choice Award for Best Golf Resorts in the Americas in the Northeast/New England region. This marks Turning Stone’s second consecutive year to be named to Golf Digest’s Editors’ Choice Award with last year being recognized for the magazine’s Best Travel for 2017 list. Golfers have looked to Golf Digest's various rankings as the complete service guide for best public courses, resorts and destinations in the country and around the globe. Golf Digest is the most widely read golf publication in the world, with nearly seven million readers a month, between its print and digital magazines. 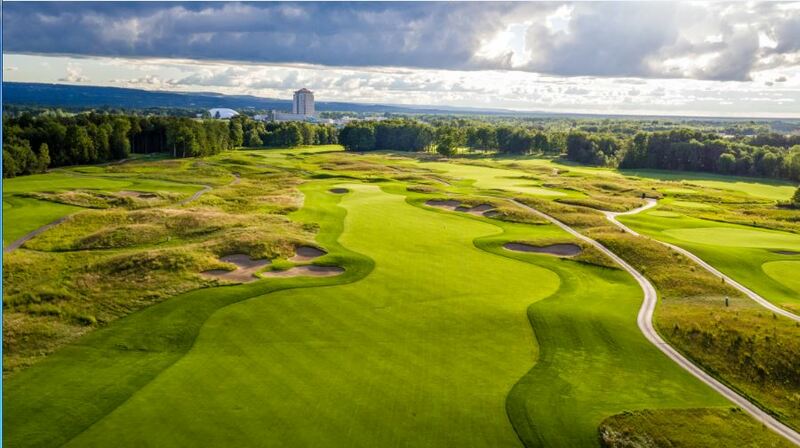 Turning Stone, and the other 2018 winners, are featured in the May issue of Golf Digest. This newest accolade fittingly comes just as the 2018 golf season is getting started at Turning Stone. Both Sandstone Hollow and Pleasant Knolls will open on Friday, April 13, Shenendoah and Kaluhyat are scheduled to open on Friday, April 20, followed by Atunyote on Thursday, April 26 (weather permitting). Regardless of the weather on the courses outside, Turning Stone also offers the best indoor practice facilities in Upstate New York. The premier golf destination recently added a new short game golf instruction area. The brand new 17,000 square foot practice area features three greens, fairway areas, short rough, long rough, multiple putting surfaces, fringe and two bunker options. Players can test their game with elevation changes of almost eight feet that allow players to practice hitting on side hill, uphill and downhill lies. The new short game area at Turning Stone is in addition to the already impressive indoor offering at The Golf Dome, which also features 40 driving range hitting stations arranged in a double-deck structure, a state-of-the-art simulator, a TaylorMade Tuned Performance Center and an expansive Golf Superstore with all of the latest golf products.